PleasCircle Kennel Club is committed to providing a safe, fun and stimulating social environment for your dog. 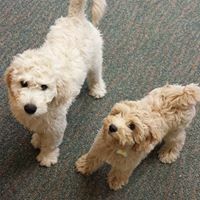 At Circle Kennel Club, your furry friend will not be home alone or crated for long hours, but will enjoy supervised playtime with other doggy pals and our friendly kennel staff. Circle Kennel Club offers a peace of mind alternative to leaving your canine pal home alone when you have to be away or knowing there is a safe fun place for them to be when you need them to be out of the house. Our definition of doggy daycare: An organized, controlled and monitored environment for a group of friendly dogs to interact and play throughout the day. The purpose is to provide stimulation, exercise and socialization for your dog. Half day is $11.00 a day which is 5 hours of play a day or less. 2 dogs $30.00 full day. Monday through Friday daycare rate is $75.00 per dog or $15.00 per day. Currently on special for just $50.00!! Please note: We do not require the dogs to be spayed or neutered, however, if this becomes an issue at any time, we reserve the right to pull the dog from the situation and/or out of daycare for the safety of all. Most times it does not cause an issue, but in the case where there are issues, we may recommend the procedure, again, for everyone's safety. Additional services available (weather permitting), great for non-social dogs that are not able to go into play groups or just does better with that type of interaction. Your pup will still get the exercise and attention he/she deserves.